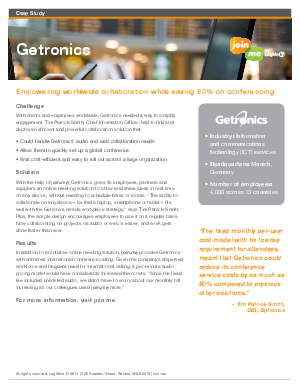 With clients and employees worldwide, Getronics needed a way to simplify engagement. Tim Patrick-Smith, Chief Information Officer, had to find and deploy an efficient and powerful collaboration solution. This case study focuses on the challenges that Getronics faces and the powerful solution provided by join.me. Download now to discover how join.me may also benefit your business.